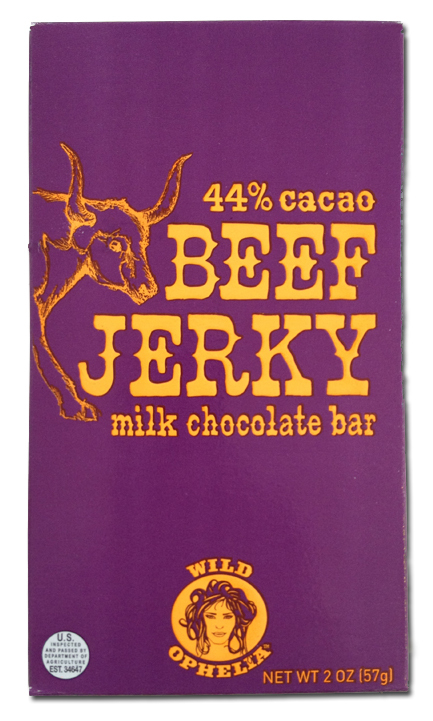 When you are an indie hipster acerbic-ly witted candy reviewer like me, and something like this Beef Jerky Milk Chocolate bar falls into your hands, well, turn on the prose! Time to go all SOMA, if not SOHA on your asses! 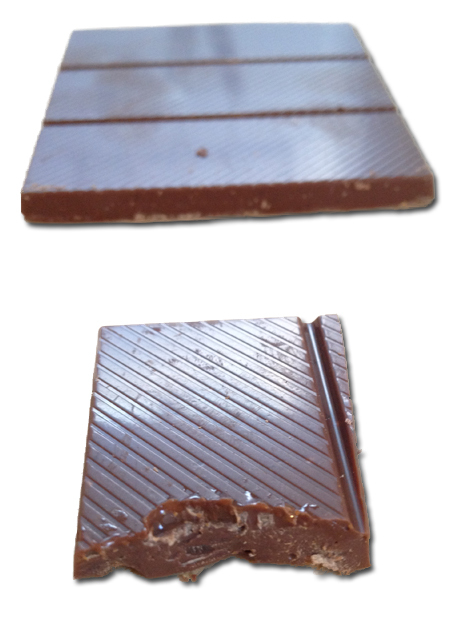 Spewing candy and tech dirt, complaining about the iOS 6.1 update draining battery, bitching about Anonymous not being what it used to be, checking OUT full-time from Facebook, all while looking for the next big thing in candy bars: gluten-FULL and drenched in coconut water! So bring on the Wild Ophelia’s bar baby — let’s DO this! Now, as intoned above, I’m obviously a Super X-Treme Reviewer, so when you say your bar of chocolate has beef jerky, well it sure as hell better kick me in the head with bull hooves and I best be picking sinews of cow muscle from my front teeth. Go Big or Go Home beeyatches! You aint better be labeling yr chocolate with jerky unless I’s be getting some JERky yo’s! ok. breathe. I sit down. I light a candle. I need to unweave this tension basket I created around my soul and just try to taste this stuff for what it is. Maybe it will knock my head off. Let’s not prejudge. Will leave the punditries aside and try the damn stuff. For us beef jerky lovers, will this bar do us justice? My sweet little 7 year old asks to try it. Because I’m a wonderful dad, I say yes. “What you taste yo?”, I asked. Yes it took me 325 words to get to this point. I know you had to wade through my noise to get to this ultimate climax (sexual innuendo TOTALLY intended). But this stuff is good. 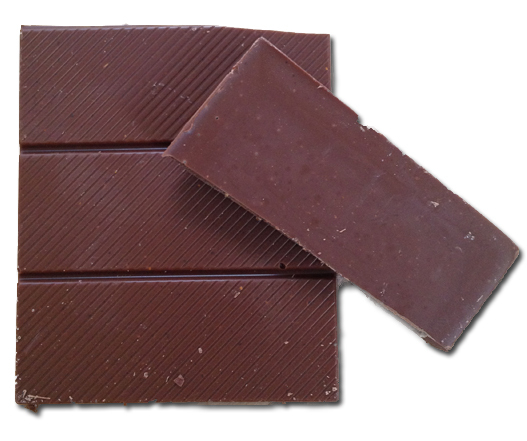 The chocolate is creamy but not Dove chocolate overly creamy. More solid. The beef jerky taste is right in there at the top of the flavor chart — very smoky. Yes, there are no bits and because I am so agro I’d like me some bits. Not sure the rest of the world would necessarily though so Miss Ophelia is probably going the right way with these. I ate a few bites. A few more. Suddenly the bar is near the end, and I got to move on. It’s Sunday morning at 9.30am. Not really a time I expected to eat an entire bar. Dammit back fat. At the end of the day (hell, at the BEGinning of the day), I’d buy these and eat again. A lot. For all you omnivores: go, retrieve, take part. The only thing you may miss is the actual chewy beef. The rest is right on like donkey kong.